1. Skip the diaper bag. Less is more when traveling. So skip the diaper bag and instead pack a small carryon bag with clothes for you, your baby, your husband and any other children. Everyone should have one full set of clean clothes in the carryon. Don’t forget underwear and socks! Throw a couple of plastic bags in there for messy, wet stuff. Fill an outside pocket with diapers, wipes, plastic bags and rash cream. Bonus Tip! Roll your clothes rather than fold so you more room in your carryon. 2. Pack snacks and drinks. Airlines no longer provide families with any special attention. So pack tons of toddler portioned snacks. Crackers, pretzels, raisins and graham crackers in snap top containers travel well. Keep them in a carryon pocket for easy access on a plane. Also pack drinks for your little one. If your baby is on formula it is easiest to bring along individual formula packets and buy a bottle of water. If your toddler has a milk or juice obsession TSA will let you bring milk or juice in a bottle or sippy cup. Just remember that there is no refrigeration. Also if you bring liquids allow some extra time in the security line. They will test all liquids. (No they won’t make you drink it.) Bonus tip! Packing new snacks or special snacks will help keep little ones entertained longer. 3. Put your baby in a sling. Traveling with a stroller is a pain in the airport because you have to pack it up and put it through the metal detector at the security checkpoint. It is much faster to simply put your baby in a sling and check the stroller with your bags. You won’t have to take your sleeping baby out during security. But airlines will make you take your baby out of the sling during take-off and landing. Bonus tip! 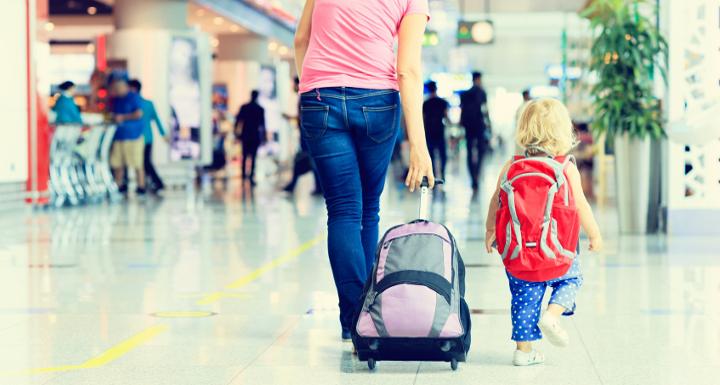 Add an additional thirty minutes to navigate the airport for each child traveling with you. Better to be early than miss your flight. 4. Bring a car seat. Yes it is heavy and a royal pain to carry around. But your toddler and preschooler won’t squirm so much if they are strapped in a car seat. Plus it’s easier for them to nap and napping children on a plane make everyone happier. Bring a car seat even if your under-two child is a free lap rider, if the flight isn’t sold out your baby can sit and hopefully sleep in the car seat. Bonus Tip! Don’t bring a booster seat. Airlines will not allow parents to use a seat without an internal harness. 5. Pack a magic bag. Go the dollar store (without your kids!) well before your trip and buy a bunch of things to keep your kids entertained. They don’t even have to be toys. My toddler loves to make his own stickers using tiny pads of post-it notes and a marker. Just make sure that whatever is in the magic bag is quiet and doesn’t have a lot of pieces that can get lost. Coloring books and blank paper are great. Legos and racing cars are terrible. Bonus Tip! Make file folder games before the trip. Just type file folder games into an Internet search, print twice and glue in a manila folder. Linnet Husi is the mom of two boys and lives in Milwaukee, working on her first novel!